“eCommerce sales increased 17.8% in the US in 2016 holiday season. – Emarketer”. 2017 holiday season is already here. It is the time of the year where the mood sets in for consumers to spend. As an eCommerce brand, you’ll be prepping for the shopping frenzy with marketing creatives, email campaigns, newsletters and discounts. Good luck with those! Amid these activities, please do not forget to Track the Metrics that would provide you with the valuable intelligence on how well your campaigns are performing – which ideas are spearheading sales and which one to re-strategize. A full-on eCommerce agency can get tracking done or even a fine SaaS tool would help (more on this later). 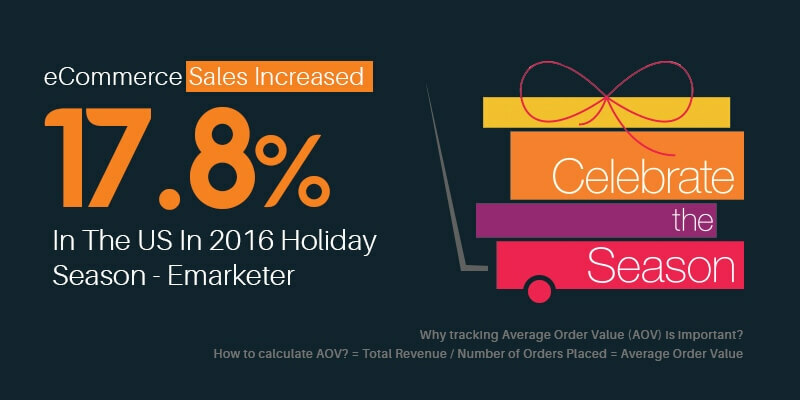 Statistics have that holiday season guarantees at the least 30% increase in sales. To make it merrier, tracking crucial eCommerce metrics is a necessity and so here we are with a select few. Average Order Value indirectly educates about customers’ purchasing behavior. It is the average eCommerce dollars customers spend when they purchase from your website. Why Is Tracking AOV Important? Increasing AOV is the most effective and cost-free way to improve profit. With more discounts, customers often tend to buy more; however, the discounts must be smartly placed as more discounts can take a toll on the overall profit. Average Order Value = Total Revenue / Number of Orders Placed. Gross Profit Margin tells you how much proportion of the money generated through sales remain with the brand after accounting for all the costs involved. Why Is Tracking Gross Profit Margin Important? Gross Profit Margin is considered as one of the important metrics for analyzing the performance of each product in terms of how much profit margin it yields. Calculating Gross Profit Margin also provides you an understanding of whether the shipping or procurement cost or the discounts that are making a dent in your profit margin. Gross Profit Margin = Gross Profit / Overall Revenue. Organic Search, Paid Marketing, Email Campaigns, Social Platforms, Mobile Traffic and Direct Visits are the most common gateways that pull traffic. Why Is Tracking Traffic Sources Important? Without stopping with just the traffic numbers contributed by each platform, dig deep to know which platform directs consumers who actually convert. Gathering information about the sources from where your site gets more amount of traffic, can help you plan your marketing expenses and focus your marketing strategies. How To Know The Source That Provides More Potential Buyer? Excavate the conversion metrics for each platform through your analytics tool. By knowing the traffic source that provides better conversion, you can zero in on sources you have to pay attention. Conversion Rate shows your business’ performance by revealing how many visitors have performed the action you have desired. In eCommerce domain, Conversion means a successful checkout. Why Is Tracking Conversion Rate Important? Apart from showing positive after-effects of your marketing efforts, Conversion Rate throws light on other issues that are turning away your visitors – Loading time, UI flaws, Irrelevant Suggestions, Inappropriate Upselling pop-ups and it could be more. How To Know How Well You Are Converting? Dividing the number of successful checkouts with the total website sessions will reveal your eCommerce Conversion Rate. Your job doesn’t end with tracking metrics, only till sales, for if you stop tracking your metrics after sales then you shall be ending with the imprecise data. Post Sales, Return Rate of your products is one of the vital metrics to be calculated to come up with the exact performance of your sales. Why Is Return Rate important? Return Rate of your product in a way determines not only the profitability but also the credibility as a trusted seller. For less the Return Rate of your product, more will be the satisfied customers and better the reviews would be and therefore increase in sales. The work gets much deeper here as finding the reason behind the return and rectifying it is one of the important actions to be done post sales. Analyze whether the return is due to a shipping flaw, broken packages or anything else and fix it. Return Rate could be obtained by dividing the total units returned with the total units sold. Return Rate: Total Units Returned / Total Units Sold. Give your customers their chance to write down positives or negatives about their experience with your brand in the form of reviews. Track reviews and you’ll get to know what has gone wrong. These are the metrics you can focus on for effectively strategizing and coming up with the new plans for the coming holiday season. You can also track these metrics efficiently with the help of a Google Analytics Expertise. eCommerce agencies that cater to CRO requirements could be a fine thought for outsourcing the tracking job on your brand’s behalf. In certain cases, eCommerce tools like TargetBay or advanced analytics tools like Kissmetrics would be handy.